These exquisitely designed digital cards have been created to encourage a spirit of inquiry, non-judgement, acceptance, curiosity, reflection and celebration among girls and women. Arranged in five suits, Girltopia can be used to help foster the many important conversations necessary to support girls as they mature to adulthood. Such conversations can be part of strategies for working with issues like body image, self-esteem, depression, eating disorders, sexualisation and bullying. These strengths-based cards can be used with groups or individuals, by teachers, parents, youth workers, health workers, counsellors and pastoral care workers. Each card features thought-provoking phrases, intriguing images and gentle questions, all devised to help invite conversations with girls. The 8 Me cards draw on the power of telling stories and feature simple sentence starters. The 11 Doing cards describe an overarching mode of action and are intended to help girls build an appreciation of their own skills, preferences and individuality, as well as those of others. The 21 Feeling cards offer gentle cues—simple words and triggers—to help foster emotional intelligence and assist girls to name, communicate and consciously navigate feelings. The 13 Us cards invite thoughtful exploration of relationships using pithy questions and conversational prompts. Girltopia presents a world of luscious plants, soulful animals and quirky architecture where girls and women are honoured for who they are and where they’re at. They aim to create a space where the risky edges of conversation and feelings can be explored in a lively and supported manner. After all, a girl’s life is very often a great adventure! Since we were ten-year-olds we have been hammered constantly with girl’s health topics, and though it’s sometimes well done, as soon as the words ‘You’re beautiful’ or ‘Let’s talk girl to girl’ come out of someone’s mouth you tend to zone out. The Girltopia cards could bring some fun and interest back into this subject. The conversation-creating properties of the cards would be good for classrooms, which tend to be a silent abyss when harder, more emotional questions are asked. These cards would be a helpful tool to knock down the invisible barriers built up between the various cliques! When it comes to supporting girls through puberty, nothing really replaces genuine, face-to-face discussions with a respected, open and skillful adult—whether a parent, teacher or counsellor, in a one-on-one or group setting. Girltopia is divided into five suits (Me, Doing, Feeling, Body and Us) and Jane chooses suits according to the activity planned and the rapport within a group. 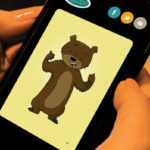 Although the cards are simple to use, she encourages facilitators to have some familiarity with the cards if possible. Jane often uses the ‘Me’ suit for icebreakers. They are great for helping people begin the business of ‘digging around’ in their own experiences and values. She sometimes asks participants to form pairs and to introduce themselves by choosing ‘Me’ cards as prompts for conversation. The ‘Us’, ‘Feeling’ and ‘Body’ suits are more often used once the group has warmed up and established trust. ‘We often don’t know what we don’t know when beginning conversations with girls,’ Jane advises. The cards—on their own or in combination—are terrific for opening conversational doors to discover the issues or subjects that young women want to address. Girltopia is also an ideal resource for teams whose members work with women or young people. The ‘Us’ cards can be used to stimulate workers’ thinking and reflection on their own views and experiences in order to address issues more confidently with students or clients. ‘They’re also a great way to hear from colleagues,’ Jane advises, allowing teachers or practitioners to reflect on the unanimity or differing perspectives within their teams. What do young people think about the messages pushed at them in school? And what’s the best way to make those messages stick? Year 10 student, Olivia Ormonde, cuts through the schmaltz of contemporary school health programs, and tells us how she’d use Girltopia to put meaning and authenticity back into important conversations with girls. The issue of positive body image is pushed in many different ways all around the school. In the gym’s change-room there are posters showing what healthy Body Mass Index (BMI) is and what foods are good to eat to maintain healthy skin. In the classrooms, there are more posters and diagrams littering the walls, depicting the side effects of drugs and of eating too much, and eating too little. Once a semester, during Years 7, 8 and 9, thirty kids pile into a classroom and listen to their PE teacher talk about health. In the lessons the experience is not an interactive one—though the teachers try. The lessons usually consist either of watching a graphic BBC documentary about the relevant topic, then completing a worksheet. Or listening to the teacher talk… then completing a worksheet. The only other time we really talk about ‘girl stuff’ is at the girls’ assembly which happens every term. Most of the time a motivational speaker or life coach comes in and talks to the girls in the school, usually about: how to love yourself, how to have good relationships and steps to having positive relationships. At one of the four assemblies for the year, we break into year levels, then into class-sized groups. When these slightly smaller girl assemblies happen, I think the Girltopia cards would be a good tool to explore topics like relationships and positive body image. If the session was correctly run and girls were willing to talk (could be a problem in a large group of girls) using Girltopia would make these sessions a much more productive use of time. The interaction with the cards will make the participants think and actually engage. Since we were ten-year-olds we have been hammered constantly with girl’s health topics, and though it’s sometimes well done, as soon as the words ‘You’re beautiful’ or ‘Let’s talk girl to girl’ come out of someone’s mouth you tend to zone out. 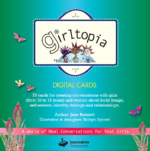 The use of the Girltopia cards could bring some fun and interest back into this subject, and perhaps take some strain off the Student Support Centre. I think the cards would be more effective in the junior levels of the school, as I feel the topics and images on the cards are more relevant to girls who are at the start of adolescence. These cards would be good to start open-ended conversations, especially the ME, DOING and FEELING cards. The conversation-creating properties of the cards would also be good to use in the classrooms, which tend to be a silent abyss when harder, more emotional questions are asked. These cards would be a helpful tool to build trust in the classes and knock down the invisible barriers built up between the various cliques!